....they shop, eat, and take photos of each other, of course! 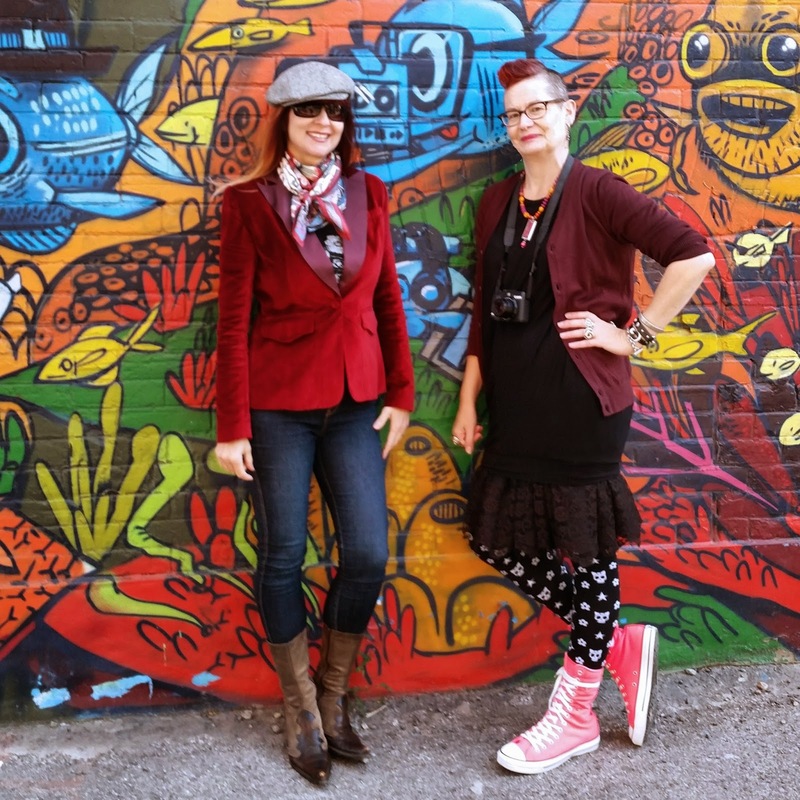 That would be Suzanne on the left, and yours truly on the right, hanging out in an art-filled alley off of Queen Street West in Toronto. I had invited Suzanne and Megan to come to the book launch party (see my previous post) with me, and Suzanne and I were able to get together in the afternoon before meeting Megan for dinner. I've met quite a few members of my blogging circle by now, and they have all turned out to be as fun and personable as they present themselves on their blog. 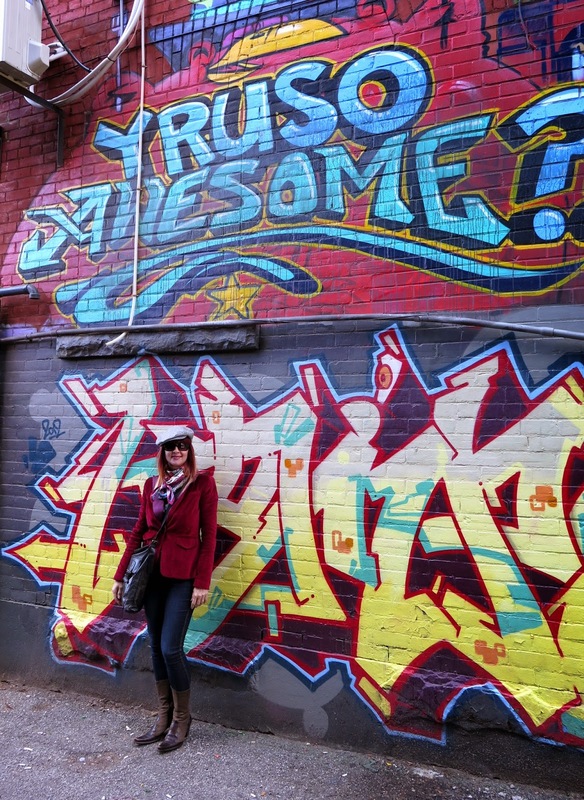 Suzanne was no exception, and we spent a very enjoyable afternoon together checking out some of the street art and the various secondhand stores along West Queen West (recently named as one of the world's coolest street style neighbourhoods). And why, indeed, we ask? 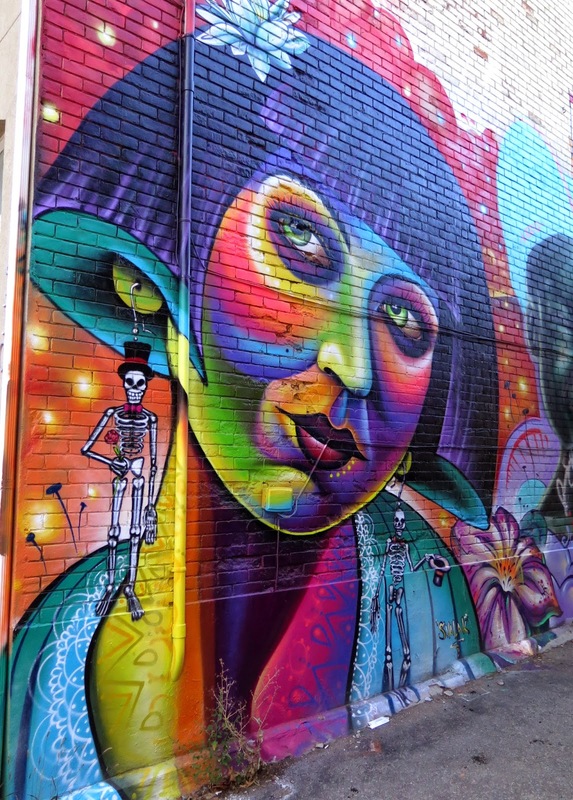 I had stumbled onto this alley a couple of years back, but there was only a fraction of the amount of art then as there is now. A few other people were taking advantage of the great backgrounds to take photos. The hipster chicken is also the work of Uber5000. We attempted a credible imitation of the woman on the wall, minus the blood that appears to be dripping from her orifices. At least Suzanne had the shades. I can't imagine how many hours went into the painting of this building. Needless to say, I was in love with the colours. 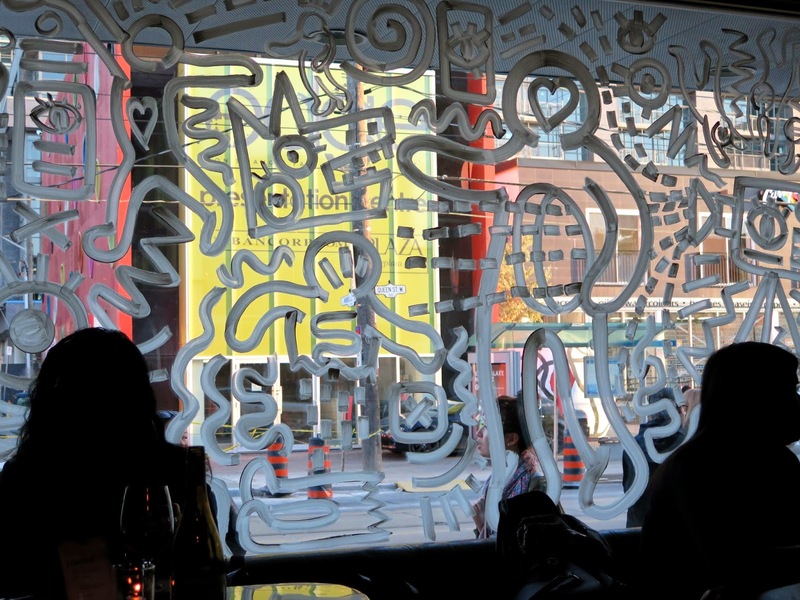 The mural is by Uber5000, aka Allan Ryan, a Toronto-based painter and aerosol artist. This was my favourite piece - the colours are stunning, and the skeleton earrings are a surprising, and delightful touch. 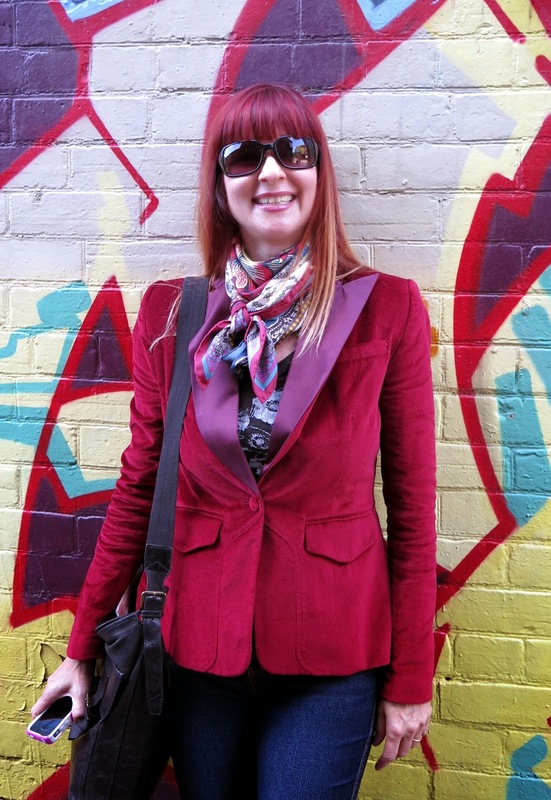 Suzanne had never been into Mama Loves You Vintage, which I discovered on my last visit to Toronto. On this day, Mahro, (photo above left) who owns the shop with her mother, Melo, was on duty, and looked adorable in her mix of Bettie Page hair, 70's eyeglasses, cardigan and cons. 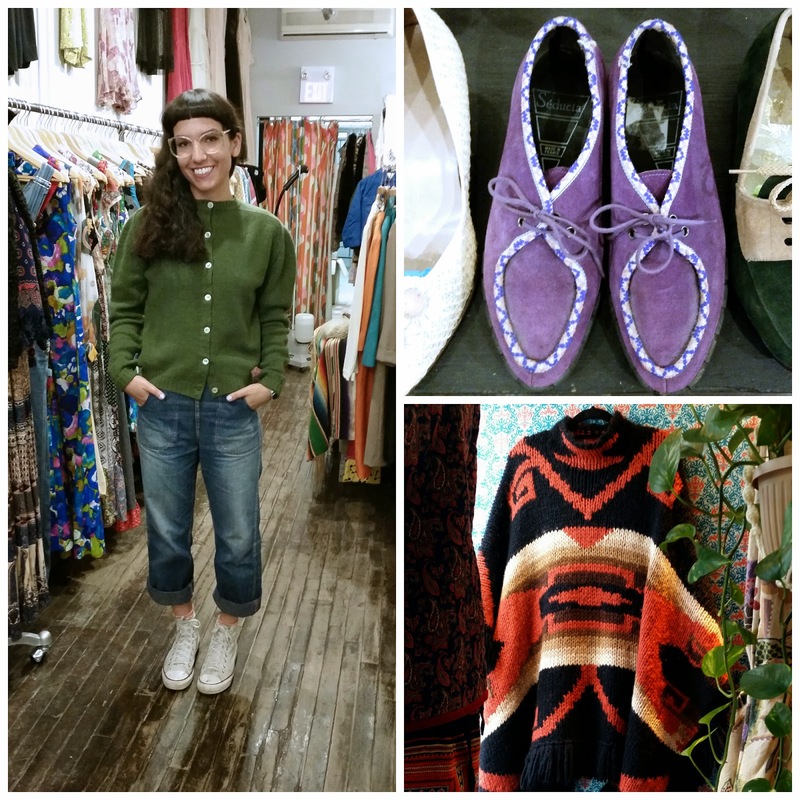 The purple suede laceups would look great with a pair of rolled up jeans and a pretty blouse, and the heavy vintage Ralph Lauren poncho in the window would keep you warm on the coldest days. 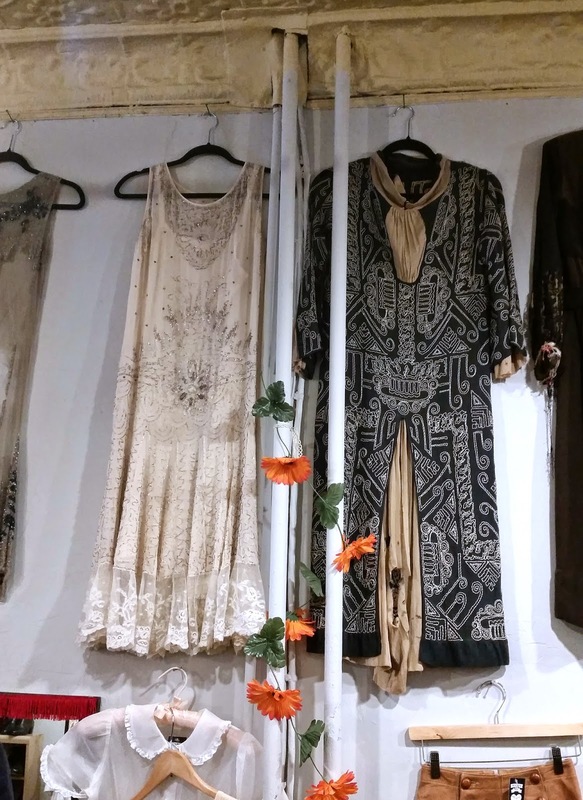 The store has a beautiful display of 1920's dresses on the wall. They would be much too fragile to wear, but the fabric, embroidery and beadwork make them gorgeous pieces of art. 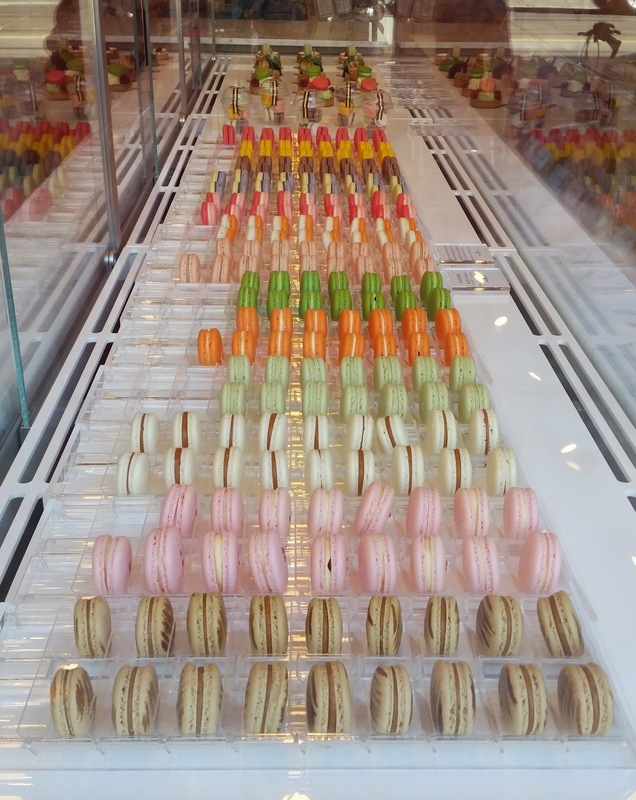 We admired the pretty coloured macarons in the window of a shop, which seemed to be the only thing they sold. The weather was much nicer than I expected, so we enjoyed a nice walk along Queen Street. 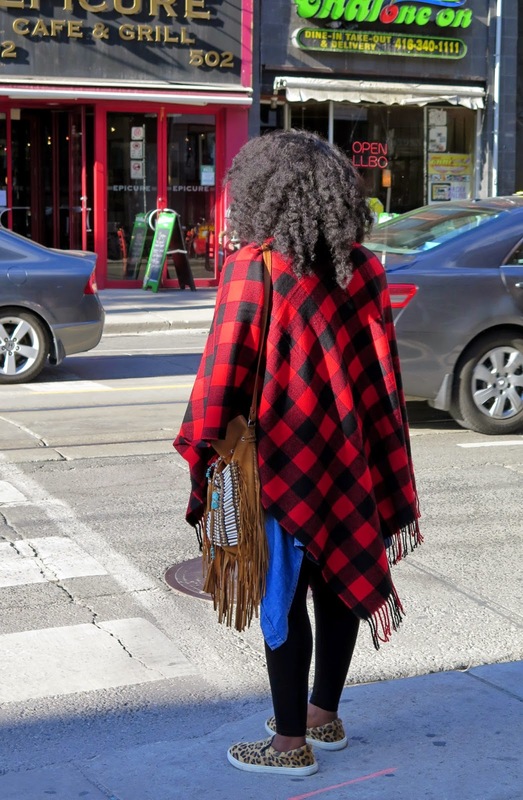 We visited both Kind Exchange stores, and each found something at the one near Bathurst Street, before heading off to meet Megan at the funky Drake Hotel for dinner. 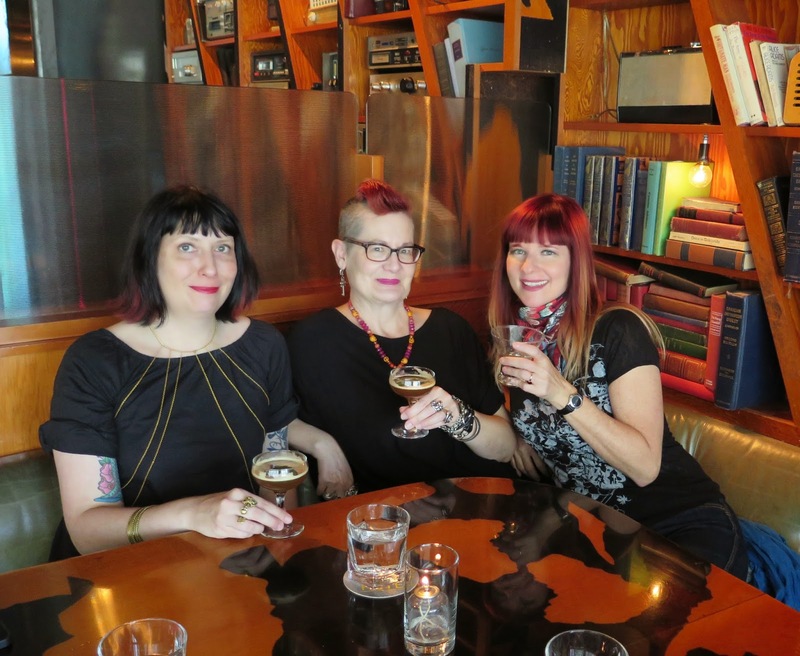 Our server was kind enough to take a photo of three bloggers enjoying a cocktail - from left: Megan, wearing a cool body chain that I am coveting, yours truly, and Suzanne. Megan and I indulged in something called "No Country For Old Men" while Suzanne went for a reliable martini. 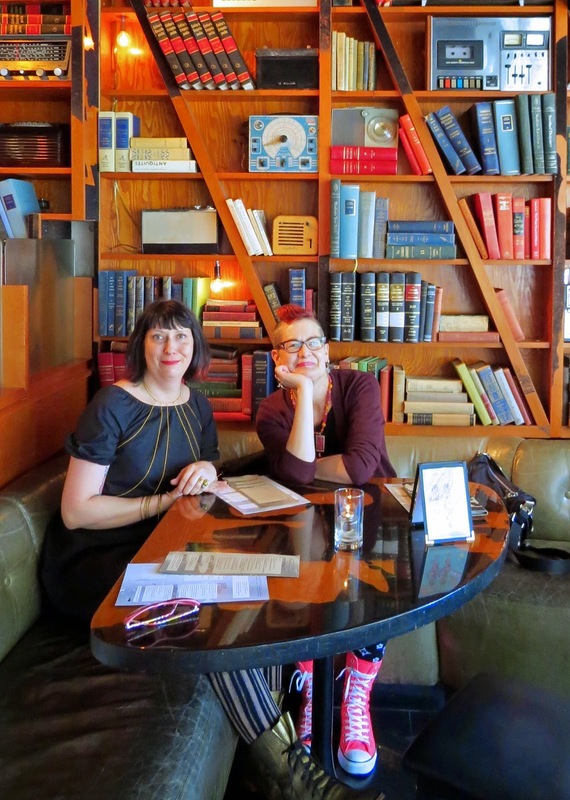 Suzanne snapped a photo of the two of us with the gigantic wall of old books, radios, and other cool stuff behind us. You can see Megan's gold fluevogs and my pink cons competing for the title of most visible footwear under the table. We had a delicious meal, and then went off to gravitypope for the book launch (which you can read about in my previous post - and don't forget to comment to enter the draw for the copy of the book). 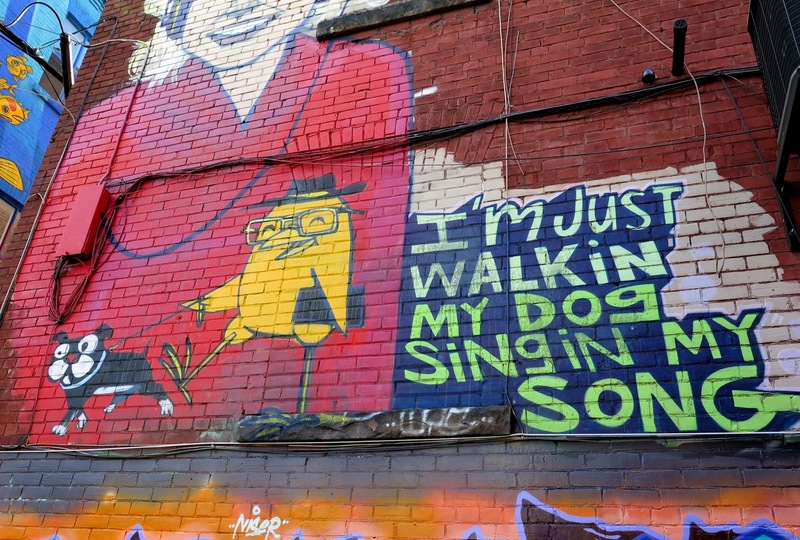 I thought Vancouver had graffiti until you showed me these walls. Stunning! Both you and Suzanne hold your own very well under their tropical majesty. I have never heard the term aerosol artist and I like it. How I would have loved to join you for drinks. Your pink shoes demand compliments. How awesome! I've followed you both for a while, and I always love seeing crossovers when bloggers get together. :D It looks like a ton of fun. 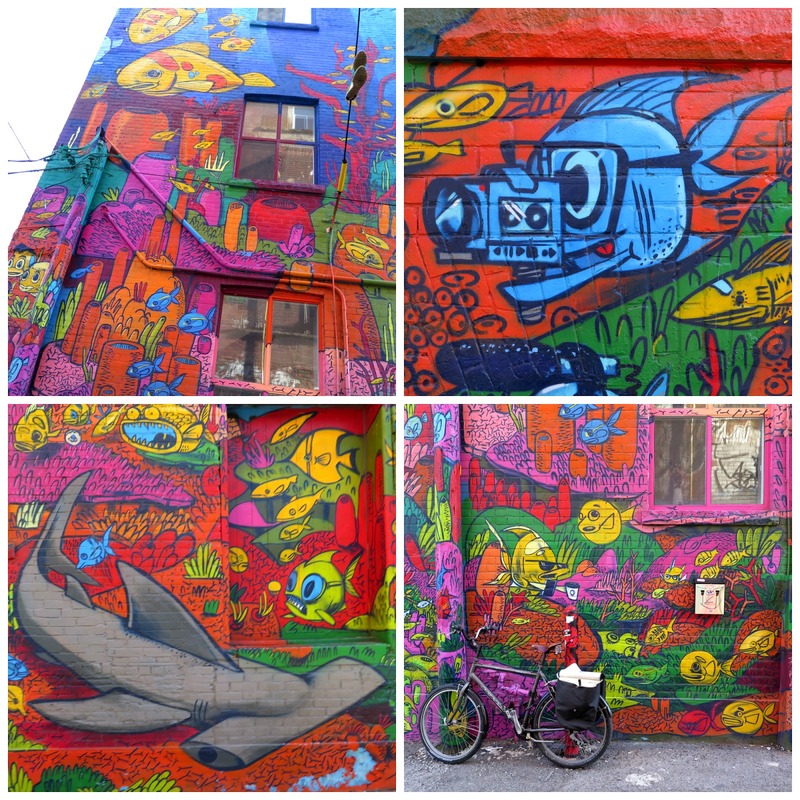 That has to be the coolest, most colorful street ever! Wow! I could look at the paintings all day. The purple shoes are too cool (and have me sad that they aren't mine). I'll have a drink later and pretend I'm with you three awesome ladies. Cheers! The mind boggles! 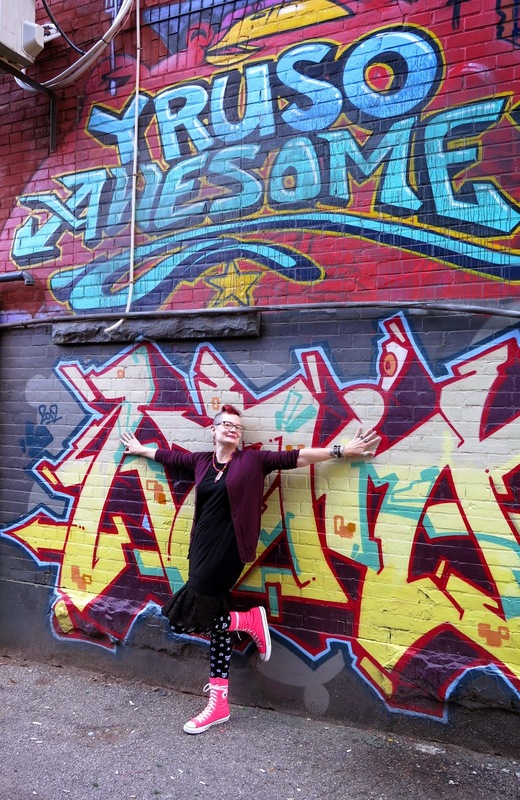 The graffiti, the bloggers, the books, the shoes - let's just say that everything is fantastic (you already know it, and I agree with you) and then I don't have to try and mention all the delicious details! Oh, so fun! I wish I could join you! The last photo is my favorite. Those under the table boots are both - or perhaps I should say all four? - yummy!!!! Oh, I know Mahro from uni. Isn't her shop wonderful? It looks like you had so much fun on your trip! 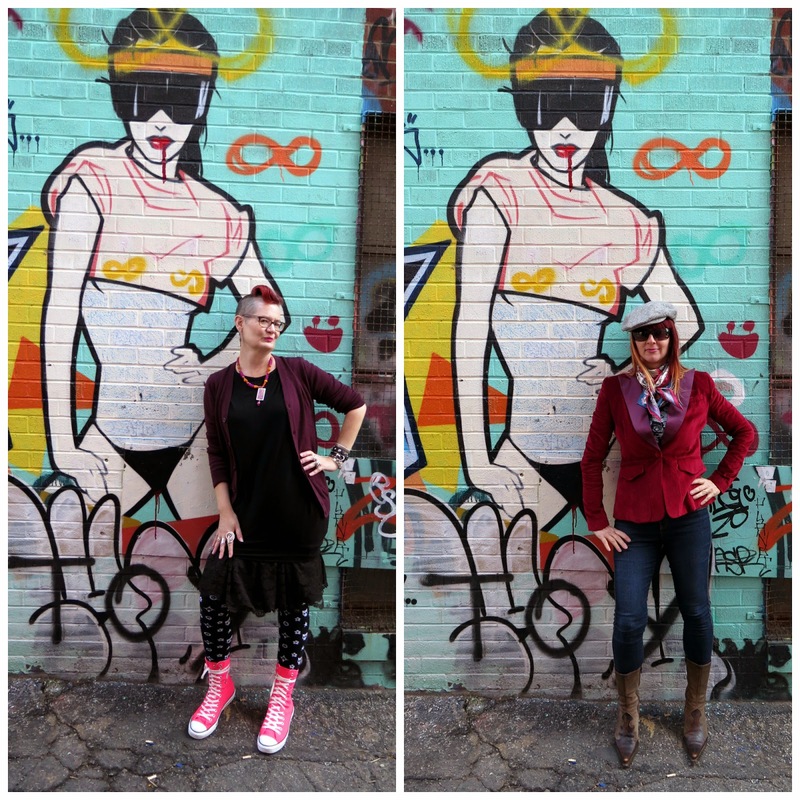 absolutely awesome meeting, you're so fabulous ladies, and look so cool on the urban background! !, really cool!! love to see bloggers meetings! !